To cooking something in bubble crown mold you need to use additional plate/pad/etc. to prevent cake damage. Perfect for cake, jelly, pudding, fruit pie, mousse, chocolate. 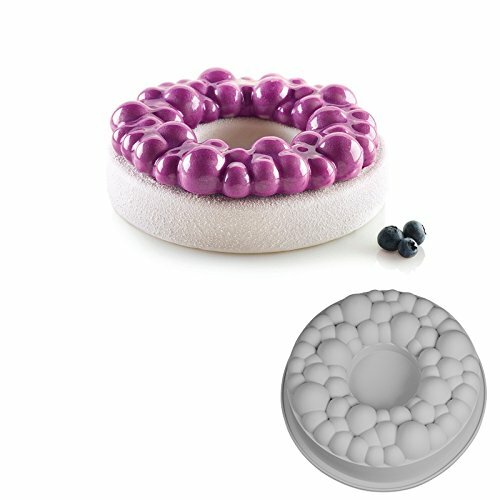 Package Included: 1 x Bubble Crown Silicone Cake Mold. Color of mold - white. Volume of full mold - 2100 ml. Volume of bubbles part of mold is 500 ml. Diameter of bubble mold - 220 mm. Small diameter inside of mold is 85 mm. Full height - 75 mm. Height of bubbles part is 25 mm. Note: this mold may be not as large as your imagine, please pay attention to the size info before you make purchase. Item measure by hand, it could be 1 cm different, your kind understanding will be much appreciated. Most popular silicone bubble crown mold. Bubble crown mold consists of 1 pcs mold, made of food-safe non-stick silicone, enabling easy and quick removal of food from the mold, perfect for ice cream cakes, mousses, but it is also suitable for baking preparations. Made from food grade silicone. Non-smell, non-toxic, durable, impermeable, easy to clean. Temperature resistance of silicone from -40°C (-40°F) to +230°C (+446°F). Volume of bubble crown mold is 2100 ml. Diameter - 220 mm. Small diameter inside of mold is 85 mm. Full height - 75 mm. Height of bubbles part is 25 mm. Freezer, refrigerator, microwave, dishwasher, and oven safe. Minimal storage space required. Please see dimensions before purchase. If you have any questions about this product by Stilnati, contact us by completing and submitting the form below. If you are looking for a specif part number, please include it with your message.